Hardware: These icons are your internal storage devices (such as your hard drive and optical drive, if you have one) as well as external peripherals — like an external hard drive or a USB flash drive. Applications: These icons represent the applications (or programs) you can launch. Most applications have a custom icon that incorporates the company’s logo or the specific application logo. Double-clicking an application usually doesn’t load a document automatically; you typically get a new blank document or an Open dialog box from which you can choose the existing file you want to open. Documents: Many of the files on your hard drive are documents that can be opened in the corresponding application; the icon usually looks similar to the application’s icon so they’re easy to recognize. Double-clicking a document automatically launches the associated application (that is, as long as OS X recognizes the file type). A collection of some great document icons. Files: Most of the file icons on your system are mundane things such as preferences and settings files, text files, log files, and miscellaneous data files. Yet most are identified with at least some type of recognizable icon that lets you guess what purpose the file serves. You’ll also come across generic file icons that look like a blank sheet of paper (used when El Capitan has no earthly idea what the file type is). Aliases: An alias acts as a link to another item elsewhere on your system. For example, to launch Adobe Acrobat, you can click an Adobe Acrobat alias icon that you can create on your Desktop instead of clicking the actual Acrobat application icon. The alias essentially acts the same way as the original icon, but it doesn’t take up the same amount of space — only a few bytes for the icon itself, compared with the size of the actual application. 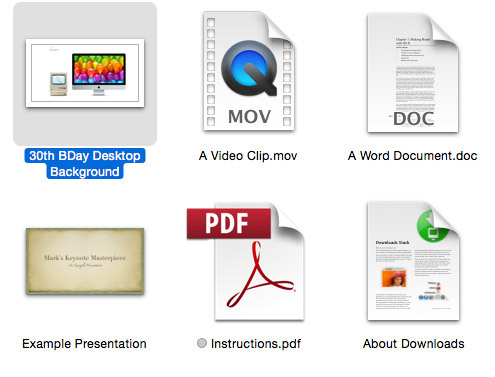 Plus, you don’t have to go digging through folders galore to find the original application icon. (Windows switchers know an alias as a shortcut. The idea is the same, although Macs had it first. Harrumph.) You can always identify an alias by the small curved arrow at the base of the icon, and the icon might also sport the tag alias at the end of its name. Choose File → Make Alias, or press ⌘+L. No, not the popular girl-spy TV show. These are alias icons in El Capitan. Here are three aliases for OS X applications, complete with that fashionable alias arrow. Drag the original icon to the location where you want the alias. Note that this funky method doesn’t add the alias tag to the end of the alias icon name unless you drag the icon to another spot in the same folder. You can launch an application or open a document from anywhere on your drive. For example, if you occasionally need to use another application while working on a Pages project, you can add an alias and launch the other application directly from the folder where you store those Pages documents. Speed, organization, and convenience. Life is good. You can send an alias to the Trash without affecting the original item. When that school project is finished, you can safely delete the entire folder without worrying about whether Pages will run the next time you double-click the application icon!